This seems to be the month for outstanding local composers and improvisers, and the trend continues in the coming week. Arguably (not by me!) the most innovative vocalist in region, Bruce Henry bid farewell to the Twin Cities last summer to return to his childhood environs of Chicago. Fortunately he left a trail of vocal breadcrumbs which he follows back every month or two. 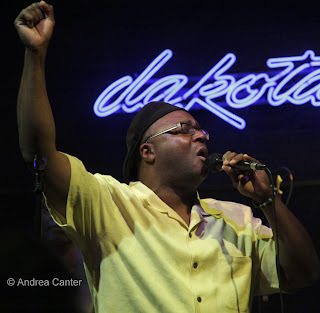 This weekend, you have two chances to hear Bruce at his old stomping grounds, the Dakota Jazz Club, with his regular band of local hotshots (Peter Schimke, Jay Young, Kevin Washington, Dean Magraw, Darryl Boudreaux). You haven’t heard “Afro Blue” til you hear Bruce. His repertoire includes original songs and arrangements of gospel, blues and some of the prettiest Gershwin you’ll ever hear. 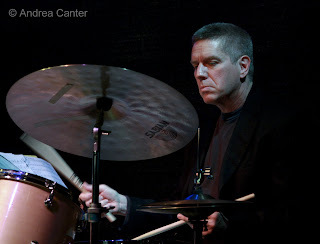 Jeremy Walker is not only one of the most ambitious composers and bandleaders in town but one of the most durable and determined of all musicians. 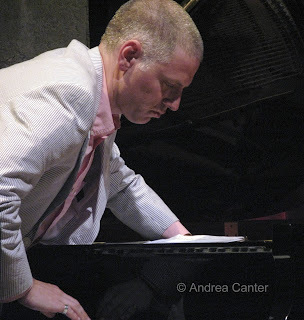 When neurological and joint maladies forced him to give up the saxophone, he turned to the piano, studied with such giants as David Berkman and Frank Kimbrough, and emerged as the keyboardist for his Jazz Is Now! ensemble. But no matter what instrument, Jeremy is a composer’s composer, and a raft of new compositions will be the centerpiece of the Jazz Is Now Nownet performance, “Winter Warmer” on Saturday night (one set at 8 pm) in the intimate Jones Hall of the Minnesota Opera Center in the warehouse district just north of downtown Minneapolis. A band with other accomplished composers and improvisers—Kelly Rossum, Chris Thomson, Scott Fultz, Anthony Cox, and Kevin Washington—makes for an exciting evening. Bless the Artists Quarter for its late start—you can catch an early set from Bruce Henry or the single set from Jazz Is Now and still make at least the second set and more from the Phil Hey Quartet at the AQ, Friday and Saturday nights (January 16-17). Hey and company (Phil Aaron, Tom Lewis, Dave Hagedorn) make the Modern Jazz Quartet seem dated while offering some of the same energy and sublime harmonies that kept the MJQ among the top jazz ensembles of the 60s and 70s. This is indeed a “modern” jazz quartet featuring four of the area’s most serious performers. If that is not enough for the weekend, there’s always Sunday! On hiatus for the past six months, Soul Café returns for a single performance at their old haunt, the Hennepin Avenue United Methodist Church across from the Walker Art Center. It’s a small gallery space, perfect for the piano/guitar/sax trio of Laura Caviani, Steve Blons and Brad Holden. Combining elegant interpretations of jazz standards with poetry readings, Soul Café is always as interesting as musically pleasing. Music at 7 pm. There’s more during the week—inauguration celebration with Four Women for Obama (Yolande Bruce, Debbie Duncan, Ginger Commodore and Tonia Hughes-Kendrick) at the Dakota on January 20th; Dean Granros (January 21) and more guitar with Framework (Chris Olson, Chris Bates, Jay Epstein) on January 22nd at the AQ; piano trio finery with the “Dakota Trio” (Tanner Taylor, Gordy Johnson and Phil Hey) at the Dakota on January 21; some very “out there” excitement with Chris Bates, Adam Linz and visiting percussionist Tatsuya Nakatani at the little gallery in Northeast, Rogue Buddha (357 13th Av NE), on January 21st at 8 pm. Chris emphasizes that this is an all acoustic performance with no amps! (It’s a tiny space, so who needs amps?) Yes, there’s a lot going on for January 21st... balance your schedule and you can probably make two gigs! If you like experimental music, one of those gigs should include the amazing Nakatani--he's also performing solo and with free jazz wizard Milo Fine at a small space in South Minneapolis, Art of This Gallery, on January 20th. Looking ahead, it never rains in Minnesota, we just get blizzards of artistic opportunities. The weekend of January 23-24 finds Pete Whitman’s X-Tet in a rare weekend show at the AQ, while Estaire Godinez comes back to town for two nights at the Dakota, followed by two nights of virtuoso guitarist/vocalist John Pizzarelli. And note that one of the Twin towns most ear-pleasing voices, Maud Hixson, is at the Times every Wednesday night this month with the Wolverines Trio. Rest up. Not sure when. Photos: Top-Bottom, Jeremy Walker; Phil Hey; Bruce Henry. Photos by Andrea Canter.